Dr. Rishi Balkissoon has joined UR Medicine's Orthopaedics and Rehabilitation as an Assistant Professor of Orthopaedics. He joins Dr. Christopher J. Drinkwater and Dr. John G. Ginnetti in our Total Joint Replacement/Adult Reconstruction Division. Dr. Balkissoon specializes in partial and total primary and revision hip and knee replacement surgery. He has special interests in preventing joint deterioration before surgical intervention, optimizing outcomes following joint arthroplasty, and the broad spectrum of simple to complex hip and knee conditions requiring arthroplasty or salvage procedures. 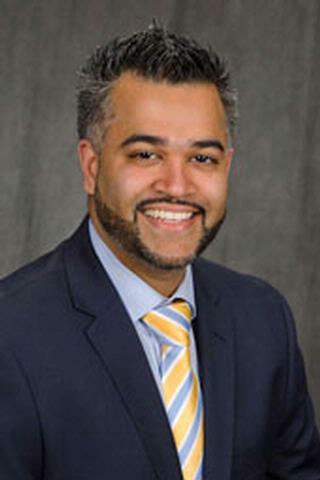 Dr. Balkissoon joins us from Chicago, Illinois where he completed his fellowship in adult reconstruction at the nationally recognized Midwest Orthopaedics at Rush. Originally from Maryland, he earned his Masters of Public Health degree at the Johns Hopkins University Bloomberg School of Public Health. Dr. Balkissoon earned his medical degree from Howard University College of Medicine in Washington, DC and went on to complete his orthopaedic residency at The Johns Hopkins Hospital in Baltimore, MD. Dr. Balkissoon has received numerous surgical and research awards and honors including election to the distinguished Alpha Omega Alpha Honor Medical Society. He is a candidate member of both the American Association of Hip and Knee Surgeons and the American Academy of Orthopaedic Surgeons. Dr. Balkissoon has given several national presentations and authored numerous publications in peer-reviewed journals and book chapters. He served as team physician for the Baltimore Orioles at Camden Yards. Dr. Balkissoon also has an interest in fine arts and jazz, and very much enjoys spending time with his lovely wife and children.